It was one of the many international invited guests, a Maori woman speaker, who made this prediction to the huge 40,000 strong crowd; to the 30,000 First Nations people from across the nation and 10,000 of us non-Aboriginal supporters who had joined them enroute to Hyde Park, Sydney, on 26 January 1988. The orators have been long leading the way. 'We can't sell that country — we can't sell it. Just like selling your own kid, own grandmother, own grandfather,' said Arabunna Elder Kevin Buzzacott at the 1998 Global Survival and Indigenous Rights Conference in Melbourne 1998. Tjunmutja Myra Watson told the Olympic Games international media, Botany Bay, 2000: 'We already lost everything at Maralinga' — the site of the 1950s and 1960s British nuclear tests. 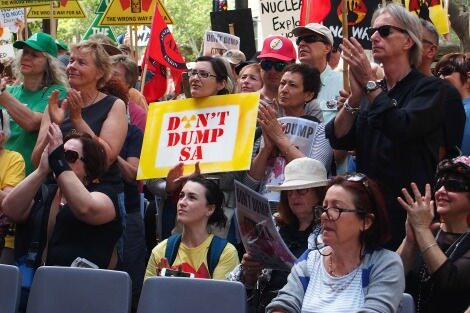 "Since 2015, in the face of the new threat of being swamped with international high level nuclear waste as well as Australia's intermediate and low level waste, the newer generation have emerged." It's my father's land you see. And it's calling out inside of me. Since 2015, in the face of the new threat of being swamped with international high level nuclear waste as well as Australia's intermediate and low level waste, the newer generation have emerged. Painters such as Mima Smart, Rita Tjunkuna Bryant. Musicians such as Johnny Lovett and the Yalata band. In the first weeks of 2017, Adelaide Weekend Advertiser readers have been exposed to two rather more mainstream artists, deeply concerned about the same phenomena. On 28 January, South Australian arts icon Robyn Archer told of of her connection to her home state. Titled 'Into the Unknown', it devoted half a page to her specific concern, urging 'a future built on risk-taking and creativity, not nuclear dumps'. "threat of being swamped with international high level nuclear waste"; a bit OTT don`t you think, perhaps? When you are the most suitable place in the world for this safe facility, and in an uranium exporting state, it seems to me very reasonable, and even one`s duty to put it there. And it really won`t be in the way, and certainly not the end of the world. That will come from the Sun; our own God-given nuclear furnace. Agree Eugene. We've got to put the world first, Australia second. Same with coal mining. If Australian coal, sold to India, can lead to reduced CO2 emissions from the world as a whole, we should let it happen. Thank you Michele for reminding us what happened to the Aboriginal people of the Maralinga lands. A dreadful crime was committed against these people by the British government in the 1950s which was sanctioned by the former PM Robert Menzies. It is very understandable that they do not want to take nuclear waste from other parts of the world. Their lands have had enough radioactive wastes. It is true that nuclear wastes need to be stored as safely as possible. The best places for it are close to where it has been used. Sending wastes long distances can mean that many people could be affected when accidents occur. The fact is that governments and industries have not been very responsible in ensuring there is safe storage for chemical wastes. Not one place should be responsible for taking wastes from all around the world. The sooner we go for safe, clean and renewable energy the better the environment will be for us and other species. Crying shame that the SA Government won't accept the outcome of the citizens jury. Jay said he would listen to the people on Q&A but has continued the push - shame on you Jay. Is the ethical question trying to squeeze out of us the true coal-less solution? A well research article. Thanks Michelle. Our water table is too precious to risk. I imagine that if the Australian public had been asked to take back waste once mined, there would have been a resounding 'NO' and we may not be exporting uranium at all. Changing the rules part-way through the game is bad sportsmanship. The rule is to keep waste as close to the source as possible. Do we see us taking back all our mined steel, e.g.? NO. Why do we need to take back uranium waste? The people have spoken. No to nuclear. Propping up a failing industry by helping it get rid of waste? No way, Jay!